So you just received your Comma Pedal from MacroFab or manufactured it yourself, but have no idea what to do next… well the next step is to get this board in DFU Mode that allows us to flash it with firmware. It’s presently an empty computer with nothing on it. Think of this like installing software on a computer. Right now it doesn’t even have an “operating system” so to speak. A solid understanding of Terminal, Unix-based environments, Git / GitHub, compiling and installing dependencies, etc. is required for this article. If you don’t feel confident in these things, I’d find your closest computer programming nerd-friend to help. This article assumes you’re running Ubuntu Linux, but most of these instructions should apply in other environments too if you‘re so inclined. This article also assumes you already have Git installed. Please ensure those things before proceeding. DISCLAIMER: This is not to be considered official documentation on the Comma Pedal. This is not an official work of Comma, Inc. and is unaffiliated with their company and platform. Proceed at your own risk. Comma, Inc. nor myself warrants this to any degree. Always keep your hands on the wheel and eyes on the road. There are apparently two ways to enter DFU Mode on this board… one involves having a Panda Paw from https://shop.comma.ai/ and the other is applying voltage to the board itself until it enters the bootloader. This article will be covering the voltage method. Found DFU: [0483:df11] ver=2200, devnum=4, cfg=1, intf=0, alt=3, name="@Device Feature/0xFFFF0000/01*004 e", serial="345D396E3137"
Found DFU: [0483:df11] ver=2200, devnum=4, cfg=1, intf=0, alt=2, name="@OTP Memory /0x1FFF7800/01*512 e,01*016 e", serial="345D396E3137"
Found DFU: [0483:df11] ver=2200, devnum=4, cfg=1, intf=0, alt=1, name="@Option Bytes  /0x1FFFC000/01*016 e", serial="345D396E3137"
Found DFU: [0483:df11] ver=2200, devnum=4, cfg=1, intf=0, alt=0, name="@Internal Flash  /0x08000000/04*016Kg,01*064Kg,07*128Kg", serial="345D396E3137"
0483:df11is the signature for the Comma Pedal so this is correct. 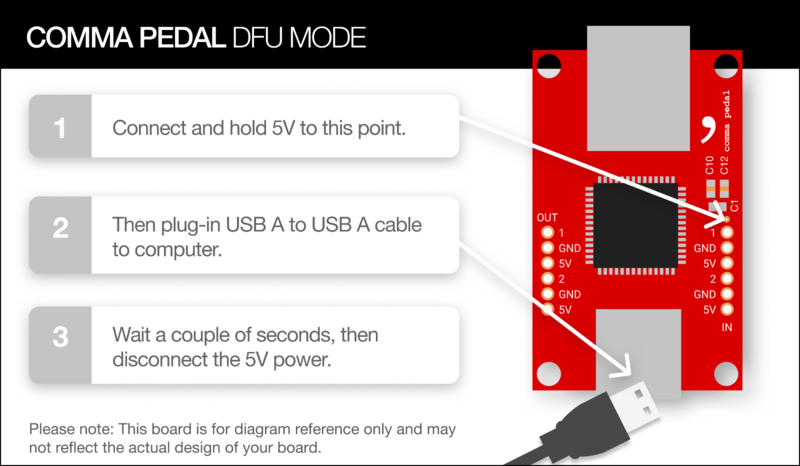 Now that your board is in DFU Mode, and dependencies are installed, you SHOULD be able to transfer the firmware to the board. I believe you can ignore the error in this as well as the Invalid DFU suffix signature warnings. When you’re finished you should be seeing a flashing green LED if your board has this. If Successful, the Pedal LED should be flashing Green. You may now unplug the pedal from USB.